Micronutrients are essential elements of our diet for health and well-being. For more information see the Linus Pauling Institute's Micronutrient Information Center. According to the 2016 Scaling Up Nutrition (SUN) Annual Report, micronutrient deficiencies are still common around the world. 30% of women are anemic from a lack of iron. 38% lack iodine and are at risk for goiters and neurologically impaired infants. Folic acid deficiency is also likely to be common. For example, neural tube birth defects are devastating malformations. These birth defects are caused in large part by a deficiency of folic acid in the first month of pregnancy. Fortunately they are rare and preventable. North America has chosen to address this by fortifying enriched cereal grain and corn products with folic acid. Folic acid is found naturally in meats, eggs, green vegetables, brown rice and citrus fruits. Some methods of cooking, such as boiling, result in loss of folic acid. Dietary deficiency of folic acid is suspected when these components are limited or missing. 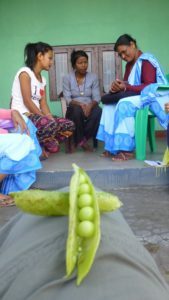 For example, in rural regions of Nepal a typical diet consists of boiled lentils and white rice (dal-bhat) with supplemental boiled greens when available. This supplies the essential amino acids and calories for an adult, but is deficient in the folic acid needed for a healthy pregnancy. Improving nutrition is possible through better education. Changing traditional cooking and eating habits can improve the content of folic acid in the diet. Supplementation is another alternative. GNE and other organizations are trying to address this problem. SUN is advocating for governments to adopt better nutrition policies. WHO is advocating for supplements for all women of childbearing age. GNE has chosen to address the need with education and supplements in specific regions where women are undernourished one village at a time, but the message is global. Stephenson, Judith, Heslehurst, Nicola, Hall, Jennifer, et al. Preconception health 1: Before the beginning: nutrition and lifestyle in the preconception period and its importance for future health. Lancet (May 5, 2018), 391 (10132): 1830-1841. Fleming, Tom P.,Watkins, Adam J., Miguel A Velazquez, Miguel A., et al. Preconception health 2: Origins of lifetime health around the time of conception: causes and consequences Lancet (May 5, 2018) 391 (10132): 1842-1852. Barker, Mary, Dombrowski, Stephan U., Colbourn, Tim, et al. Preconception health 3: Intervention strategies to improve nutrition and health behaviours before conception. Lancet (May 5, 2018), 391 (10132): 1853-1864. Global Burden of Disease 2015 Mortality and Causes of Death Collaborators (2016-10-08). Global, regional, and national life expectancy, all-cause mortality, and cause-specific mortality for 249 causes of death, 1980-2015: a systematic analysis for the Global Burden of Disease Study 2015. Lancet. 388 (10053): 1459–1544. Supplementation with Multiple Micronutrients Intervention Trial (SUMMIT) Study Group, Shankar AH,Jahari AB, Sebayang SK, et al. Effect of maternal multiple micronutrient supplementation on fetal loss and infant death in Indonesia: a double-blind cluster-randomised trial Lancet (January 19, 2008) 371 (9608): 215-27. “Folic Acid Supplementation for the Prevention of Neural Tube Defects: US Preventive Services Task Force Recommendation Statement” USPSTF, JAMA. 2017;317(2):183-189.